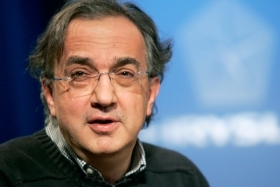 Sergio Marchionne is a step closer to his goal of merging Fiat's auto business with Chrysler's. TURIN – Chrysler Group's fortunes will be crucial in creating value for shareholders of the new automotive-focused Fiat S.p.A.
Chrysler could add between 2.75 euros and 5.40 euros (about $3.70 to $7.20) per share to Fiat's basic value, according to financial analysts polled by Automotive News Europe. Fiat's 20 percent stake in Chrysler, currently with a zero book value, is the biggest positive element seen by analysts for the new Fiat S.p.A, which will comprise the Fiat, Alfa Romeo, Lancia, Ferrari and Maserati car brands when it starts trading on Jan. 3. Fiat's truck and tractor units will be spun off on the same day into a new unit called Fiat Industrial S.p.A.
Analysts expect Fiat's shares to be worth about 6.10 euros per share while Fiat Industrial shares will trade at 8.20 euros. Fiat's automotive business represents 63 percent of the group's expected 2010 total revenues, but analysts give a higher value to the industrial unit's shares because the auto business will have bigger investments to fund and will have lower profit margins. Fiat shares have traded slightly above 10 euros in recent weeks. • Morgan Stanley's Stuart Pearson said Fiat's stake in Chrysler and increasing synergies and business between the two automakers could add another 5.40 euros per share to 7.30 euros value he currently envisages for the new Fiat S.p.A.
• Max Warburton at Bernstein Research factors in the value of the Chrysler stake at 2.75 euros per share -- more than half of the 5.20 euros he predicts for the new Fiat. • Banca IMI's Monica Bosio factors in 4.50 euros per share related to Chrysler – that is 3.30 euros for the value of Fiat's stake and 1.20 euros in potential synergies – in her 7.40 euro price target for the new Fiat. “With Chrysler, we gained the scale which made Fiat's spinoff possible,” Fiat Chairman John Elkann told shareholders at a Sept. 16 meeting that approved the separation of the automotive and truck/tractor units. He said with Chrysler Fiat is stronger in geographical size and in product reach, with a model range that extends from the tiny Fiat 500 minicar to Ferrari supercars, to large pickups from the Ram brand to large SUVs such as the Jeep Grand Cherokee. Fiat CEO Sergio Marchionne aims to boost Fiat and Chrysler's combined annual sales to 6 million units in 2014 from 3.45 million last year. He said Fiat's automotive and industrial units would now be free to pursue their own strategic choices, including alliances. The spinoff will take Marchionne a step closer to what is widely considered to be his goal of merging Fiat's auto business with Chrysler's. In his view, a consolidated Chrysler would also allow the U.S. automaker's profits to be added to Fiat's profits from Brazil, compensating for Fiat losses in Europe. Erich Hauser at Credit Suisse is less optimistic. He notes that Fiat Auto and Chrysler remain two underperforming companies, both losing money on a net basis last year and so far this year. “It will be difficult for Chrysler and Fiat to generate cash over the next few years,” he said. Hauser said Chrysler relies heavily on sales to the U.S. construction industry, with the Ram as the vehicle of choice for small contractors and builders. “No one is envisaging U.S. housing to recover soon,” he said. Hauser has not revised his 9.00 euro target price given to Fiat as a whole in July.